I know we have created for ourselves such a hustle-bustle world, and actually listening to someone slows us down. It slows me down to have to take the time to listen, to reflect back what I think I’ve heard. It takes time to make sure I heard it right. And maybe by the time the other person is ready for my turn, time is up. That’s OK. We don't always have to get our turn. We can let go of that need. But we do have to be ready, just in case. So let us know some numbers. 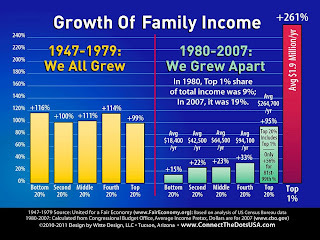 Q: In 1980, what was the percent of the nation’s total income that was earned that year by the top one percent? A: It was eight percent in 1980. That’s a number I had read and forgotten, and re-looked it up this week, and I’m going to try to remember now. That, and the next number, are worth remembering. 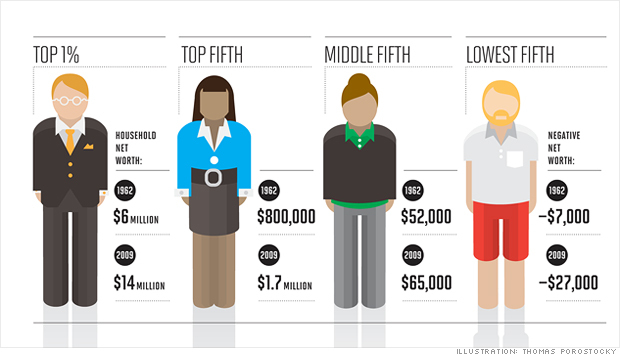 The top one percent of incomes accounted for 8 percent of the nation’s total income in 1980. Eight times the average income would seem to be plenty. Who could want more than that? Surely that’s more than enough. You can probably tell where I’m going with this. We had some substantial income inequalities 30 years ago, and today, you guessed it, it’s even worse. So, how much worse? Q: What percent of the nation’s income goes to the top one percent now (well, as of 2007)? A: Robert Reich, the Secretary of Labor under President Clinton, and now professor of public policy, reports that in 2007 the top 1 percent of US earners were bringing in 23 percent of the nation’s total income. Starting in the early 20th century and continuing through the middle decades of the century, the trend in this country was toward steadily improving income equality. The gap between the top one percent, or the top twenty percent, and the average of everybody else was shrinking. Then that trend reversed. Our spirits long to be made whole, to be connected to each other on this wonderful world we share – to be connected with equals as equals. I don’t mean that we all have to have exactly the same income, but when the inequalities get this bad, it has a corrosive effect on the social contract, and on our souls as a people. Various studies in various ways show that when inequality is greater, violence goes up, trust goes down. – so write Richard Wilkinson and Kate Picket in their illuminating study, The Spirit Level. When we're all in it for only ourselves, there's increased political polarization. This is not a life of spiritual wholeness. Update: See Nicholas Kristof, "An Idiot's Guide to Inequality" NYTimes, 2014.07.23 -- CLICK HERE. This is part 2 of 7 of "Our Spirits Long to be Made Whole"
Next: Part 3: "High Inequality Corresponds to Low Social Health"
Previous: Part 1: "Lost But Making Good Time"